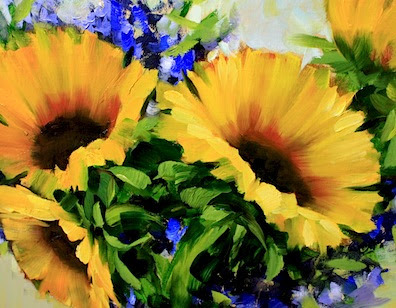 Thrice Bright is the newest sunflower painting in Flower Mound Studio. Even though the pugs are dozing and the house is quiet, I'm having a little party in the studio - I'm excited to announce my first sunflower video! The hubby is working on the full length DVD video for me, which is fortunate, considering the only thing I know how to do on an IMac is to overfill the memory with photographs of flowers. I detected a bit of shock and awe when he discovered last week I had filled up the entire Mac hard drive in less than 12 months. But that's a problem for another day, since today we're celebrating! Take a peek at my new video and let me know what you think! Très jolie vidéo... Plein de bonnes choses pour vous aujourd'hui. Beautiful and an excellent video too, Nancy. I saw a thumb nail for "Tick Tock White Hydrangeas" and I am currently swooning. I would much rather take a class from you personally, but since that's not possible at this time - this video will be GREAT! !